Holly Woodhead showjumped clear at the Equi-Trek Bramham Horse Trials this morning to win the Bishop Burton College under-25 CCI3*. Holly had led all the way from the dressage with her father Ian and stepmother Heidi’s DHI Lupison, and she secured victory today with one of only two fault-free performances. She won by 11.2 penalties. Dani Evans had the first part of the treble at 12a down with Luana Edge’s Smart Time, but held second place. She also took third on Vanessa Watson’s Raphael II, who moved up a place with just two time-penalties. Millie Dumas also had two time-faults, but that elevated her and Artistiek from eighth overnight to fourth. Emily King dropped from third overnight to fifth after lowering fences six and 12a. Last year’s winners, Tom Jackson and Waltham Fiddlers Find, slipped one place to sixth with eight faults for hitting fence three, a blue parallel and the white upright at fence eight. Wills Oakden held seventh with 10 faults on Alfi Brown, while France’s Francois Lemiere had all three parts of the treble down to move from sixth to eighth with Ogustin Du Terroir. Sweden’s Ludwig Svennerstal’s one down with Franzipan elevated him from 11th to ninth. 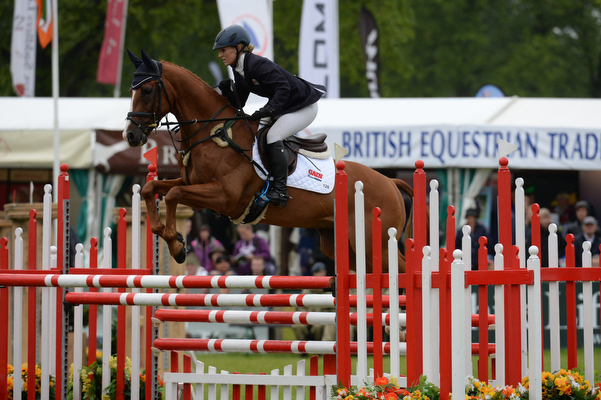 The USA’s Caroline Martin recorded the only clear in the time apart from Holly’s to move up from 14th to 10th on Quantum Solace. Bert Bolton, who had been ninth overnight, was eliminated at this morning’s horse inspection with Purple Sands. Check back later for a final update on the senior CCI3*. Full report from Bramham in the magazine this week, our Thursday, 18 June.